David Barnes caught the big snapper below while boat fishing just 10 metres from Tiri Island at the end of Whangaparaoa Peninsula. The snapper, taken on 6kg line, weighed 20lb and was caught using a 5/0 Target Snapper Hook. The fish was landed after a fight lasting 25 minutes, on Wednesday 27 November. The big snapper had three good runs away from the boat, the first run was around 50 metres. Dave reports it was an exciting experience catching a fish like this in amongst foul and only 15 metres of water. The tide was just over the low and David hooked into his fish an hour and a half before sunset. The snapper was caught using a whole side of a kahawai for bait with the Target hook at one end of the bait, and a half hitch of the line around the other end of the fillet. David is a real fan of long baits and always uses fresh bait. His favourites are kahawai, trevally or live yellowtail mackerel if targeting kingfish. Dave and his fishing buddy caught 36 snapper between them on this trip plus seven kahawai and one trevally. They released at least 24 fish. All the fish that David released fish were over 30cm in length and were lip hooked. Dave noticed his mate was catching and gut hooking small snapper so convinced him to try the Target Hooks. He did and this saved his mate the hassle associated with unhooking any more gut hooked fish and also undoubtedly saved the lives of several small fish. 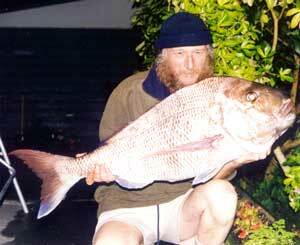 David specialises in catching big snapper using 6kg nylon on his rod and reel. David prefers the Target Hooks as the line does not suffer from chafing so there is no need to stop fishing and retie his traces, and also because he does not have the hassle of dealing with gut hooked small fish. Unfortunately the weather started to close in just as the fishing was hotting up but David is determined to land another big snapper soon. David fishes out of a 4.2m aluminium boat and prefers to fish over foul ground. While at Ahipara for the weekend with the Kite Fishing Club, David Billings managed to land a good sized snapper. Using his Bottom Longline Rig he caught the 6.2kg snapper at Rarawa Beach near Houhora. By the time David got the fish to the weigh station the following day (November 10th) the fish weighed in at 5.9kg. A good snapper either way and was one of a haul of 12 for David and his fishing mate Jamie Cullen. We had a busy week last week before the easterly wind and swell arrived on Friday. Unfortunately for us we have been unable to get out fishing since. The swell was still around three metres on Monday. Attached is a photo of the largest gurnard (on record), caught in NZ on 6kg line - 1.58kg. This was caught by Gary Kemsley on the 9th November 2002. The rest of the gurnard in the photo were caught on the same day by Gary, using a surfcasting rod. 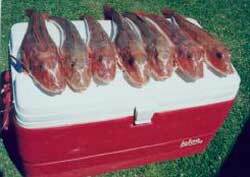 The pending NZ record for gurnard on 6kg line is 1.56kg. This fish was caught by Philip Pearpoint from Sportsworld Fielding. 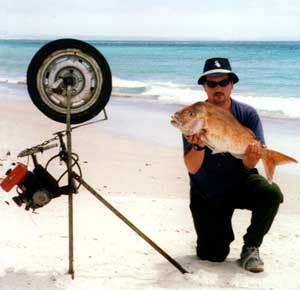 Phil was surfcasting at Porangahau Beach on the 26th October 2002 when he landed this fish. To claim a NZ record your fish must weigh at least 0.025kgs heavier than the existing record. There are other criteria as well, but these fish go to prove we have some good fishing at Porangahau. You just never know what you might catch off the beach. Interestingly, Gary informed me that the gurnard in the photo above were all full of baby flounder. We managed a half days fishing last Thursday in our boat, first time for a few weeks. We headed out about five miles, out wide of the Bay, and were lucky enough to catch a small groper and a bin full of tarakihi. My first opportunity to fish a west coast beach since purchasing my Flexiwing Kite was on Sunday 24th November. I fished from 3.30pm until dusk at the southern end of the beach, not knowing the beach well enough to want to travel further. I knew it would be dark when we returned. We caught one snapper, two kahawai and one shark. I used salted mullet for bait and put out four sets of five hooks. The sea was calm and the tide was going out when we were fishing. It was the first day of northeasterly wind for months and it was nice to actually fish a surf beach for a change. Fishing on the eastern side of Tiri Island, just north of the wharf, David landed the kingfish after a fight lasting 40 minutes. He was using his 6kg rod and reel and fishing in 10 metres of water. The kingfish swallowed the livebait whole and gave David a good fight last Saturday afternoon. An interesting observation by David was the nylon hanging out of the gills of the kingfish. When David gutted the fish he found a Black Magic 6/0 hook in the guts of the fish that was attached to the trace hanging out. The hook must have been in there for some time as the protruding trace had barnacles on it. Despite this, the fish was in good condition according to David. I have been fishing Scotts Ferry out of Bulls for a few years now. Up until now we have used the kayaks to put the longlines out, which has seriously limited the days we can fish. I bought a Super Kite a few weeks ago, amidst laughter from my friends who claim we never get an offshore breeze. I have tested it out a couple of times on the school field. Talk about easy to launch. I am gutted as I have been stuck at home doing school reports since I had the kite and we have had easterlies almost every day. My friends who I usually go out with went to Himitangi yesterday, Novemeber 30th, and paddled out in choppy conditions. Unfortunately they caught nothing. I will be heading out with the kite next week you can guarantee it. School finishes at three. I will be at the beach by ten past. Will let you know if I have more luck. We have had some very encouraging fishing reports coming in during the week. Fishing seems to be good on both coasts. Coromandel Peninsula is fishing well as is the Bay of Islands, Bream Bay and off the west coast. One party went fishing out of Raglan and caught plenty of snapper, all of them weighed over 10lb. Craig from Tackle King in Te Puke reports a private boat went out from Raglan and came back with a snapper weighing 10.4kg. This is great news for anyone fishing the west coast this weekend. Kariotahi and Port Waikato should be good places to target, on Saturday in particular. Have you checked out our home page lately? We have new links to make it easy for you to navigate around the site. Check out our list of retailers, find the one nearest you to get all your kitefishing replacement rigs and accessories. Make sure you are getting all the latest information - use the refresh button when you log onto the site.